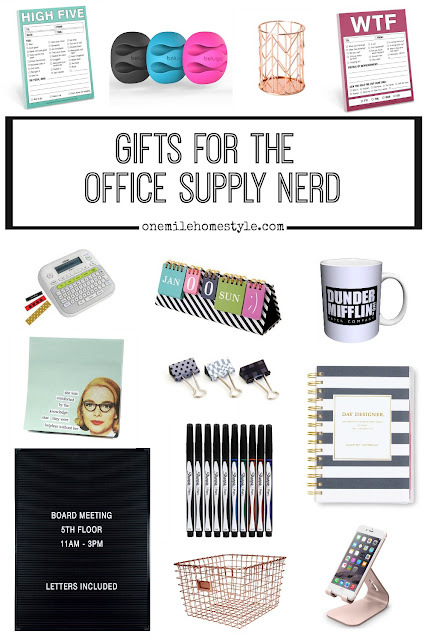 This may be one of my very favorite gift guides, gifts for the office supply nerd! I can't help but walk down the office supply aisles when I am out running errands, and while everyone else is dreading back to school shopping in the summer, I can't wait! There is always something new that I need; something that I'm sure is going to make me more organized and productive. If this sounds like you, or someone you know, this is the gift guide for you! Desktop Calendar // This calendar is sure to add some fun to your desktop all year round! Cord Organizers // I have cords all over my desk, these are definitely going in my shopping cart! Label Maker // My label maker comes in handy all the time for keeping me and the kids a little more organized all around the house. Phone Stand // This, I totally need! Wire Baskets // Baskets and trays keep the messy stacks of paper looking organized, and the gold finish adds a stylish touch. Sharpie Pens // These pens are my absolute favorite, I think I have them in every color! Planner // I am a paper planner girl, and every year I pick up a new Day Designer planner. They always have so many cute cover choices, and they work great for keeping me organized at home and at work! Office Coffee Mug // Surely a Dunder Mifflin coffee mug is a must-have for any office, right?! Letter Board // Letter boards are popping up every where, and this one is on my wishlist. It's the perfect spot for reminders, or fun inspirational quotes. Fun Notepads: Anne Taintor // High Five // WTF // I am a sucker for post-its and notepads, I have a desk drawer that is full of both, so what's a few more to add to the stash?! Pen Cup // You have to keep all those pens organized and within reach, and this is perfect option. Binder Clips // Fun black and white binder clips will add a little flair and keep your desk organized, I love the plaid ones in this set! So, tell me, what are your favorite office supplies that are on your must-have list? Ever since I was a little girl I have had a stationery habit. I'm always drawn to the stationery section in large department stores. I hope you realise you are feeding my already out of control addiction. Shame on you ! Claire, its sounds like we share the same addiction! Great roundup of ideas. When I worked in an office I loved to peruse the stationary isle in the stores!